I don’t have too many new favorites this month, but I do have a list below of the things I got at the recent VIB sale! I’m still waiting for a few of them to come. With the warmer weather coming, I’m AGAIN wearing a lot less makeup, but my go-to’s since last month’s post have been the Tom Ford Cream and Powder Eye Color (that stuff is incredible and I get so many compliments on it! I swear it twinkles under the lights!) and the Marc Jacobs Glow Stick. Alllll about the glow. the Moroccan Oil Classic Brush. This may be a weird thing to mention and I sort of think it’s gross to show a used hairbrush, but I have to talk about how much I love this. And another brush (the P80) that I got. Guys, it has been a horrifically long time since I have bought new hair brushes. Like I can’t even tell you how long because you will think it’s sick. A really, really long time. (Actually, I’ve purchased a new brush or two but they never felt as great as my older ones and quickly broke.) I grabbed two moroccan oil brushes from amazon and have not looked back. The boar bristle one? I use at night to come through my hair before bed. It does cause a little bit of static, but I’m going to bed so who cares. It feels amazing on the scalp. The other one is for morning use and anytime I style my hair. I LOVE THEM. Totally worth it, because the few brushes I’ve bought have been much cheaper and fall apart quickly. It Cosmetics CC Illumination Cream. A repeat mention but I’ve almost finished the bottle of the illuminating CC cream and will never get the regular version again. This gives SO much glow to my face… I’m sure some people think it gives too much. The only downside to this is that sometimes when I rub my cheek against Max’s cheek, he gets some sparkle on his face. Still. I love it. CoverFX Illuminating Setting Spray. I know that I mentioned this last month, but now that I’ve used it for another full month, I can tell you how fully obsessed I am with it! I’ve even been using it in cases where I don’t need a setting spray (like just have on a bit of tinted moisturizer) because it is SO illuminating. Really loving it. Marc Jacobs Highliner Crayon in Grapevine. If you’ve been reading for awhile, you’ll know that for YEARS (like maybe 10 years?) I solely used the Urban Decay 24/7 liner if I ever used any eyeliners. It has been ages since I bought one, but I do have a few of these highliner crayons and find that they are so similar. This is so soft and blendable, and I love that it’s matte too. I’ve always worn purple on my eyes and while I’ve majorly toned down any color in the last few years, I love smudging this as eyeliner – it doesn’t look to bright or harsh. Maybelline Instant Age Rewind. FOREVER favorite. I just bought another one and have been grabbing this super often this month as I need to swipe something on quickly since we have people here remodeling the kitchen EARLY. This is the best stuff. Rosebud Tropical Ambrosia Balm. I haven’t ever been a huge rosebud salve fan (especially in the pot) and probably haven’t bought any since high school. I was instantly dying over this scent, however, and couldn’t resist! I am loving this balm and it tastes like the tropics. Perfect. Charlotte Tilbury Hot Lips lipstick in Bosworth’s Beauty. This has been my go-to shade this month for lips because it’s SO bright, but not in a too-shocking way. If that makes sense, ha. These lipsticks are awesome, though I do like them best with a light lip balm (like Burt’s Bees underneath). They stay on forever too. And you can easily add gloss over top! Now for things I bought at the sale? Not a ton of fun an interesting stuff, really. I bought some things we always use, like the FAB Ultra Repair Cream (Eddie and I use it daily), a new bottle of St Tropez and two mitts for self tan purposes, a new beauty blender and a new eyeshadow brush (just the sephora collection one). In terms of fun things, I bought one of the new Hourglass strobing blushes, the Coola Face Self Tan Serum and my most exciting purchase, the Briogeo Charcoal and Coconut Exfoliating Shampoo. I can’t wait to try that! I’m old. Annnd that was my month! Nothing too exciting. I don’t think I have anything else I’m dyyyying over for summer. What is on your list?! 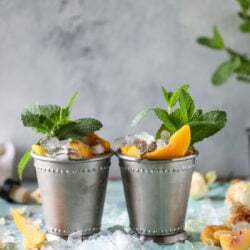 Frozen Peach and Vanilla Mint Juleps. Ambrosia Whipped Yogurt Fruit Parfaits. love the beauty posts! I have used the Mason Pearson hairbrush my entire life. It’s really the best! One day, make sure you try it! i have wanted to try one forever! I’ve been currently obsessed with the two CT Kissing lipsticks my sister gave me for my bday, Coachella Bella & B!tch Perfect. I need a nice light pink now! That concealer is my fave! And I absolutely love IT Cosmetics products. Their super cream and serum foundation are my new go-to’s. I have also been loving Glossier’s priming moisturizer and boy brow. Love that lipstick shade! i am dying to try some glossier products! are they really great?! I really love the boy brow! I can’t fill in my brows to save my life lol so this stuff is great for me! i love the boy brown and priming moisturizer! the stretch concealer is nice too but its very emollient and you have to set it. I just got the Moroccan oil hair brush last month (the p80) and love it! It’s life changing after not getting a new hairbrush for ages. And it’s soooo light that I no longer get a sore arm while blow drying my hair! right?! i could not agree more! i will definitely try this! i think it’s from target, right? Not sure if it’s at Target! I bought mine online at Ulta. They have buy one get one 50% off right now! I don’t care for the Smith’s potted lip balm either, but the balm in tube form sounds interesting! I love coconut. That is a gorgeous CT lipstick! That lipstick has been a go-to of mine this month too! I picked up the Urban Decay Makeup remover spray at the VIB sale, and I can barely even…. it is so amazing. I was using the Make Up Forever Sens’ Eyes in the past, but always thought it was super messy, especially with waterproof mascara – it seem d as though I rubbed for hours. But this stuff dissolves it. Completely. Like I have no idea where it goes but it’s no longer on my face. You should try it! i have been so tempted to get this! adding it to my list! I need to know more about this exfoliating shampoo! I know you’re another dry-skin lady, and if your scalp is as dry as mine, and this helps you, I’m buying it! It feels like nothing I do makes it any better! I bought a mix pack of Karuna sheet masks and the sunscreen sampler thing from the VIB sale. With a baby under 1, I’m so focused on skincare right now because I have zero time for makeup! i have only used it once so far, and love it! also, love those sheet masks. so good! Last month I got the UD Naked Skin foundation. It is awesome. Feels like a dream, well like nothing on, and no rubbing off on my baby! I have a half finished tube of the IT CC cream, but it always felt so goopy and thick on, plus zero staying power. Figure it will be something to put on after my normal SPF on beach days. And loving the UD (apparently I’m on a kick) Perversion mascara. Holy lashes. One coat is great. If I have the time for two, oh man. As always, love these posts and reading everyone’s comments. I find it so interesting how we all have such different opinions on makeup products. Ha, probably why we feel the need to try it all! i also really like UD naked foundation ! i have heard wonderful things about UD foundation! i tried a sample but may give a go! I love everything UD. Oh and for my dry lip peeling friends out there, Avene Cold Cream lip balm is now my HG. No peeling. If I wear lipstick, I just make sure to use this to moisturize afterwards and I am all set. Seriously, no peeling, no dry patches. Anyone know how the IT CC cream compares to Bare Minerals BB cream? That’s what I currently use and while I like it- it feels nice on my skin- I’m looking for my one true BB/CC love! I would also look into the Urban Decay Naked Skin One & Done. The lady at Ulta put IT CC cream on one side of my face and the UD on the other side. After just wearing for the afternoon, I really liked the way UD lasted, didn’t cake, and felt very light and natural. i’m in the same boat as Julie! Complexion rescue is what I use every single day – it’s much lighter coverage. The It CC Cream is a bit more coverage so I use it when I want more makeup on, I’m going out, to an event, etc. I really don’t like foundation, so the IT CC cream is my answer to that! This may sound like a weird question, but how do you apply the Maybelline concealer? When I use the little sponge, I feel like it’s tugging at my skin a little too harshly…so I attempted to dab it on my finger, and then onto my undereye area. Is that weird? I must be doing something wrong! wow really? i have always used the little sponge! i basically just sort of dab it on there and then use my fingers to blend? Gah!! I’m sure it’s user error! I bought the Marc Jacobs Glow Stick during the VIB sale and used it for the first time today and oh my gosh, I love it! I thought it might be a little much for work but wanted to try it so bad so I did but just used a little bit and it gave just the perfect, subtle glow that’s not over the top for the office. I’m I’ll be able to build it up for when I really want it to be seen. i love it so so much! I fell so in love with, and dropped a bunch of saved gift cards on, the packaging and products from urban decay x jean-michel basquiat; they’re definitely the most beautiful beauty collab I’ve ever seen(performance-wise, it’s all UD so it’s great, but my favourite to wear have been gold griot eye palette and exhibition lipstick). I liked Tarte Maneater eyeliner, Maybelline Inti-Mattes lipstick in Honey Pink, and Too Faced white chocolate chip palette, too. MAC lands at the Ulta next door to my work in a couple weeks, btw–anyone else getting MAC at theirs and taking out a second mortgage to prep…? those UD products do look So gorgeous!!! and I think my Ulta is getting MAC too. AHHHHH! LOVE the Age Rewind concealer! It’s so cheap and does a great job with coverage. It’s a staple in my makeup bag. I need to try the Moroccan Oil Brush though. I recently got a Wet brush after my hairstylist used one at my last appointment but I love the boars hair bristles on my round brush so I’m sure I’d love it on a regular brush. Thanks for the recommendations! i like the wetbrush too! i just use it more so when my hair is… wet. haha! right after showering. i go the DE Lala cream and the SR Juno oil in the sale. so far so good. Also got a new Bite lipstick in Rhubarb that i am loving. Im trying the Becca pink undereye corrector and think it might be better than Maybeline rewind (gasp!). May hair is just ok for now i’m using Oliplex treatments to try to stop breakage. Still to early to tell if its working though. once i cut my hair shorter the breakage was much more obvi and a problem. im interested to hear about that shampoo. i love the bite lipsticks! best consistency!! I got the benefit cheek parade palette and ive been wearing rockatour ever since. Id been wanting to try any of the benefit bronzers or blushes but couldnt bring myself to drop 30 bucks on one–but the sale price of 49 for 5 is a steal! And I treated myself to the nirvana white dry shampoo. zero regrets and i’ve gotten so many compliments on it!